Monday is time for us to see splash of yellow! 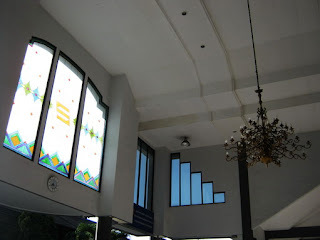 I can share yellow things that I saw at Gubeng Train Station in Surabaya, East Java, Indonesia. When I waited for our train, I saw another train coming; lots of yellow on it. A large glass window near the ceiling has yellow touches, too. Nice! A camera can be a good friend while we started feeling bored waiting, right? really colorful. have a nice yellow monday! 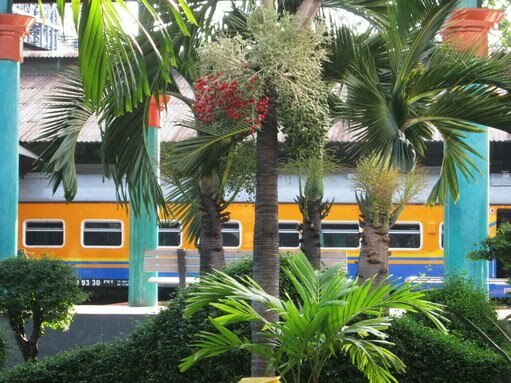 hmmm.. the yellow train is nice but i like the tree even more.. lol! by the way, do you mind checking out on The Lighter? taking good photographs, although the trees are beautiful trees that dominate. Traveling is one great way to capture different interesting stuff with colors. Hope you can visit my mellow yellow, thanks! You got that right lina. Hubby called me a "picture lover" because I took a lot of pictures of everything.